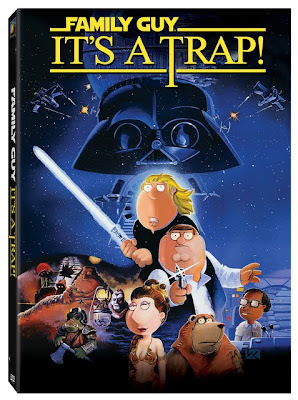 AKA: Family Guy Presents "It's a Trap! "; It's a Trap! After vetoing their original working title of The Great Muppet Caper -- most likely because that is the name of an actual Muppet movie -- the Family Guy staffers saddled with delivering a Griffin style satire of Return of the Jedi temporarily dubbed this woefully unfunny "Fuzzball" installment We Have a Bad Feeling About This. Like the final title It's a Trap, the origins of Bad Feeling do indeed stem from real lines of dialogue used in the fanboy beloved George Lucas Gen X classic Star Wars trilogy – before those recent awful “prequels” made you judge the titles that came decades before them with a more discerning eye. 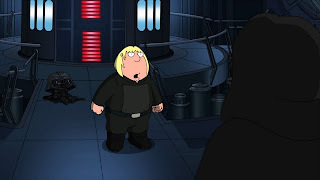 However, after watching this surprisingly disastrous finale to an otherwise creative collection of LucasFilm spoofs, it's safe to say that both post-Muppet titles gave us a good indication of the Family Guy showrunners' and staffers' attitude towards the production. Unfortunately the dialogue isn't meant to work as ironic, reverse psychological humor to fool us into eventually having a great time. 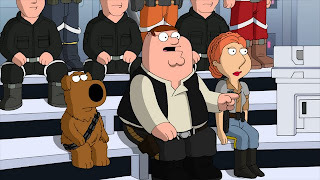 No, Peter's line echoes the behind-the-scenes "bad feeling" of his voice-actor, alter-ego – series creator Seth MacFarlane – who urges us to lower our expectations during the opening crawl that plays opposite the legendary John Williams' instantly recognizable, pulsating score. Skipping the usual plot summary to bring us up to speed in the Star Wars universe, in the onscreen text MacFarlane explains that not only did the creative artists not want to make this film but felt trapped into it by Fox to satisfy the money-lust of the studio due to the success of previous entries Blue Harvest and Something, Something, Something Dark Side . While it's irreverent and off-the-wall, unfortunately the crawl marks the funniest gag in the entire movie... that is until we discover that it wasn't really a gag at all. 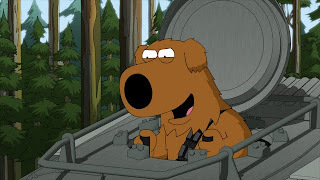 For in confessing that Fox told MacFarlane that he had to try and amuse us so that he can get a payday, he sounds a bit like a tactless kid who informs you that his mom told him he had to be nice to you so that he can get an ice cream. 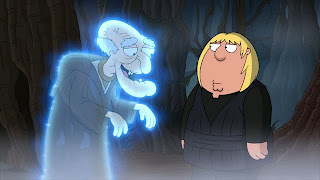 Yet luckily he bookends this idea of “pity the entertainer whose job it is to actually entertain” at the end of the movie wherein – as a response to endless in-jokes made at the expense of actor Seth Green who voices Chris Griffin – the characters that MacFarlane doesn't "play" temporarily turn the tables on MacFarlane by calling him out. 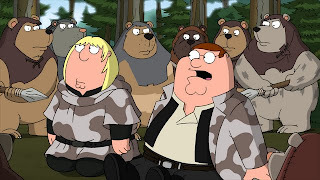 Nonetheless, this scene, like a great majority of those that wound up in Trap -- despite my belief that they would've landed on the cutting room floor in any given season of Family Guy -- ultimately serves as proof that the staff writers need to see other people... if only for a little while. Like a group of comedians who ignore everyone else at the party and just hang in a corner testing out material to try and crack each other up, the MacFarlane scribes of Guy , American Dad and The Cleveland Show need to abandon their tendency to seek humor amongst themselves. Whether they're spread too thin creatively or just need to go outside and engage with others to bring a fresh approach and joy back to their work, you can't say MacFarlane's crawl didn't warn you that overall this Trap of recycled, repetitive gags feels like the product of claustrophobia rather than the comic innovation we've seen from them in the past. While the technical specs of this Blu-ray combo pack are superb as the sound and animation work overtime to dazzle us where the humorless script fails, ultimately the aptly named Trap is roughly on par with a Star Wars prequel.